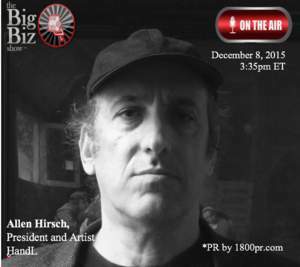 HandL, President and Prolific American Artist Allen Hirsch to Be Interviewed on "The Big Biz Show"
NEW YORK, NY--(Marketwired - Dec 9, 2015) - HandL, a revolutionary gripless phone case designed to be a natural extention of your hand, announced today that company president and prolific American artist Allen Hirsch, will be interviewed on "The Big Biz Show" hosted by Bob "Sully" Sullivan. HandL is a phone case that was developed to create an organic interface between hand and phone, that allows users to relax their grips on their smartphones. In this exclusive interview, Mr. Hirsch will discuss how he put his artisitic creativity to work to create a revolutionary patent pending product. HandL is currently available for the iPhone 6/6S, iPhone 6/6S Plus, and the Samsung Note 4 and Note 3 at $49.99. There is a 20% off holiday promotion using the "holiday" promo code at checkout and a preorder price of $29.99 for the iPhone 6/6s and iPhone 6/6s Plus in White that ships in December. Allen Hirsch is a prolific American artist, writer and entrepreneur. Mr. Hirsch and his work have been featured on the cover of TIME Magazine 5 times, in the New York Times 3x, and a feature spread in New York Magazine. He has created new painting techniques including string painting, new cubism and has pioneered brain lateralization studies in art. Allen has developed special real estate and hospitality properties which include the world famous restaurant La Esquina in Soho. In 1993, he did the inaugural Bill Clinton portrait for Natl Portrait Gallery which also hung in the White House. In 2010, Mr. Hirsch made worldwide headlines when his pet monkey companion "Benjamin" and a tourist got into a disagreement. Mr. Hirsch has sometimes hid out in the basement of his building for months on end while the monkey and Mr. Hirsch were on the New York's most wanted list. A movie about Allen and Benjamin's life will be presented to TriBeca Film Festivals and SXSW in 2016. 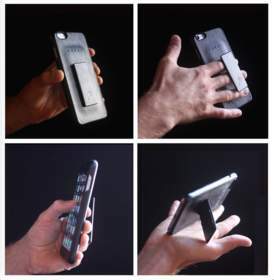 HandL is a secure, gripless case designed to be an organic interface between hand and phone. The HandL case uses a elastic and brace system to apply easy pressure on just one or two fingers against the back of the phone, eliminating the need to grip the device. This gives the effect that the phone is simply floating in your hand. As the average cell phone user looks at their phone 150 times a day, HandL allows you to access and operate your phone fully with only one hand. This allows a more seamless integration of these devices into our busy, multitasking lifestyles. And when you need both hands, HandL ingeniously converts into a portrait and landscape stand. It is currently available for iPhone 6/6S, iPhone 6/6S Plus, and the Samsung Note 4 and Note 3. To learn more about HandL, please visit us at www.handliberation.com.